Performance measurement is a popular activity of organizations in the transportation sector. Various studies on the performance of transportation organizations with the utilization of data envelopment analysis models have been common. 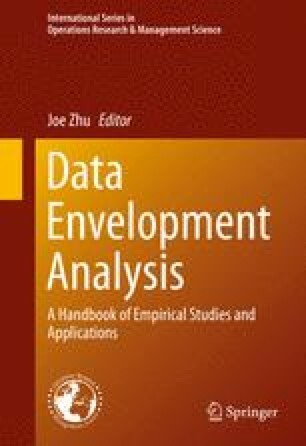 However, based on the unstorable characteristics of transportation services, conventional data envelopment analysis models are not suitable, and then network data envelopment analysis models are proposed. This chapter is dedicated to describe the network operational structure of transportation organizations and the relative network data envelopment analysis model. In order to be closer to real operational situations, four operational characteristics, which are route-based performance evaluation, environmental factors, undesirable outputs, multi-activity framework, are discussed and incorporated into the network data envelopment analysis model, respectively. Part of the material in this chapter is adapted from Yu, M.M. and Fan, C.K., 2006 “Measuring the cost effectiveness of multimode bus transit in the presence of accident risks”, Transportation Planning and Technology, 29(5), 383–407, Yu, M.M. and Lin, E.T.J., 2008 “Efficiency and effectiveness in railway performance using a multi-activity network DEA model”, Omega, 36, 1005–1017, Yu, M.M., 2008 “Measuring the efficiency and return to scale status of multi-model bus transit—evidence form Taiwan’s bus system”, Applied Economics Letters, 15, 647–653, Yu, M.M. and Fan, C.K., 2009 “Measuring the performance of multimode bus transit: A mixed structure network DEA model”, Transportation Research Part E, 45, 501–515, Yu, M.M., 2010 “Assessment of airport performance using the SBM-NDEA model”, Omega, 38, 440–452, Yu, M.M. and Chen, P.C., 2011 “Measuring air routes performance using a fractional network data envelopment analysis model”, Central European Journal of Operations Research, 19, 81–98, Yu, M.M., 2012 “Performance assessment of transport services with the ERM-NDEA model: evidence from a domestic airline in Taiwan”, Transportation Planning and Technology, 35(7), 697–714, with permission from Taylor & Francis, Elsevier Science and Springer.